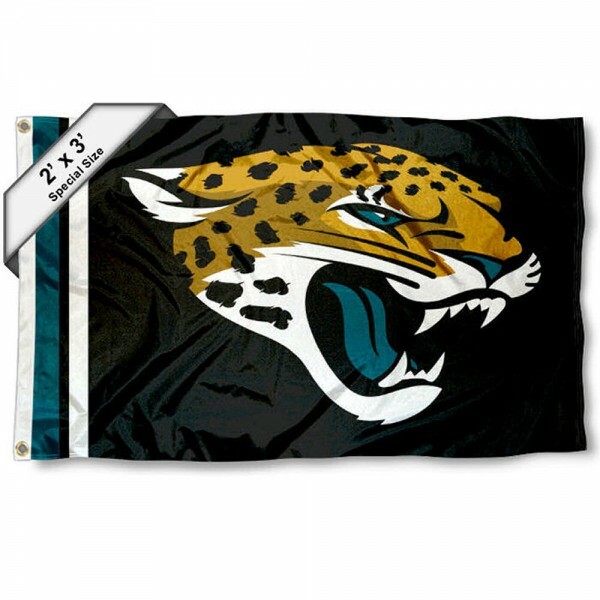 Our Jacksonville Jaguars 2x3 Feet Flag is constructed of single-ply polyester, has quadruple stitched flyends for durability, measures 2'x3', and has a side header with two metal grommets to attach to your flagpole. The NFL Officially Licensed logos and colors are screen printed into the flag so the logos are viewable from both sides with the opposite side being a reverse image. To display your team allegiance, fly this 2x3 Flag below your 3x5 or 4x6 foot USA Flag or use this flag as a large Jacksonville Jaguars Nautical Boat Flag.